Come bike or walk the Shining Sea Bike Path in Woods Hole along the Cape in Massachusetts when you spend your vacation at our Cape Cod Hotel. We have been having beautiful spring weather and the Shining Sea Bike Path is always something that is fun and different every time you visit. 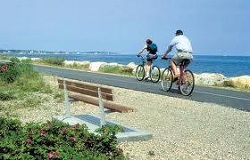 This flat bike way has now been extended 10.7 miles with portions of it along the Vineyard Sound shoreline and is FREE to enjoy. 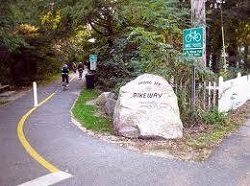 The Shining Sea bike path has history dating from the 1970’s when it first became a bike path. The path was named from a line in the song “America The Beautiful”, “from sea to shining sea”, written by a native of Falmouth, Katharine Lee Bates. The town of Falmouth purchased the railroad right of way in the early 1970’s. By 1975 the railroad tracks were removed and the bike way was officially opened. 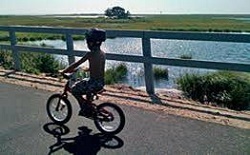 The bike path passes through ponds, woodlands, cranberry bogs, and saltwater marshes. All along the way you will see nature at every turn. Many bird sightings, marine wild life, red foxes and if you’re lucky some deer. There are plenty of places to stop and rest to catch your breath or sit and watch nature. You can catch a fun swim at some of our beaches right on the path too. Not wanting to drag your bike to the Cape? Don’t worry there is a nice bike rental shop two minutes away from the North Falmouth Entrance to the Shining Sea Bike Path. “Art’s Bike Shop” is reasonably priced and includes helmets. Rental for a single bike from 8am-5pm is $25, for 24hrs you can rent a bike for $35, and for the whole week $95. If you have little kids with you they also have trailer pull behinds. To rent the trailer from 8am-5pm is $15, for 24hrs is $24, and for the week it is $65. Don’t worry about food there are lots of nice restaurants and ice cream shops to stop at in Woods Hole. If you enjoy shopping there are several very cute shops in Woods Hole at the end of the path. For more information about the Shining Sea Bike Path, Click Here. So come and enjoy Cape Cod at Green Harbor Waterfront Lodging, a pet friendly place, in Falmouth, Massachusetts. See you soon!! !